on Singapore Island, is a major entrepot and commercial center of Southeast Asia. On Jan. 29, 1819, Sir Thomas Raffles founded the city which became a property of the British East India Company in 1824, the capital of the Straits Settlements in 1836, and a great port, trading center and British Naval Base. 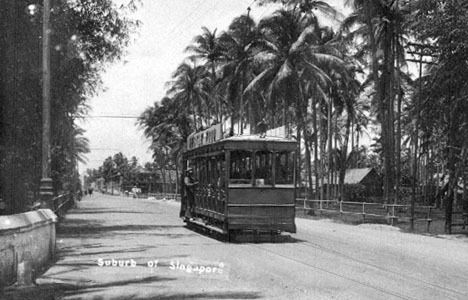 A steam tramway was operated to Kranji from 1885-1894 and there were two electric tramway experiments: along a block of track at the docks in September, 1891, and along a mile of track on the Kranji line in September, 1892. The city tram system opened on July 25, 1905, and by 1907 was operating 60 trams on more than 26 miles of track. The postcard shows a tram at the end of one of the suburban lines. All rail operation ended on April 9, 1927.